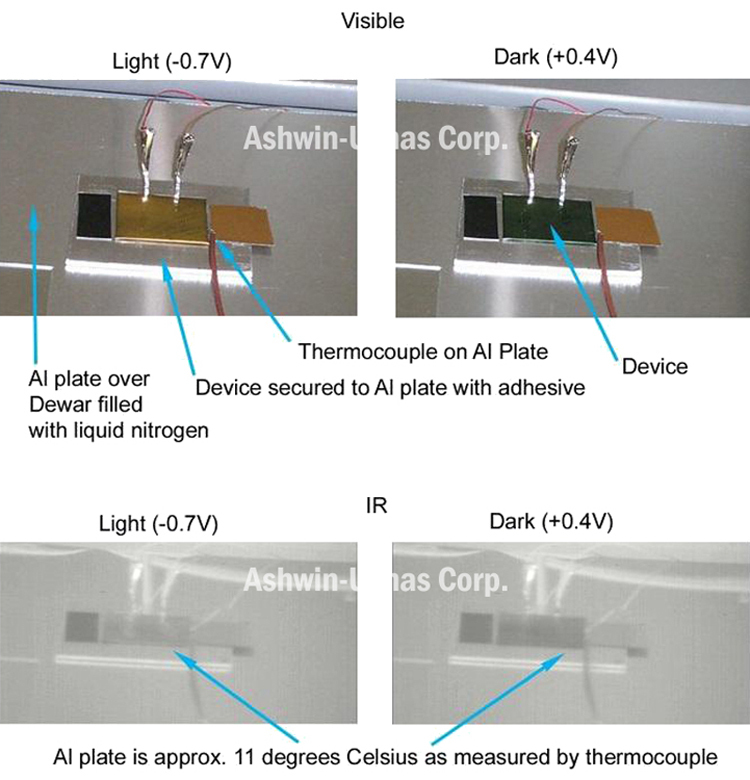 Infrared (IR)-Electrochromic Skins for Dynamic Camouflage and Related Applications | Cutting Edge Technology | Ashwin-Ushas Corp. | Ashwin-Ushas Corp.
IR-electrochromic materials change “color” in the IR, dynamically. This “color” is variable and can be adaptive, i.e. matching the background, much like a chameleon, except in the IR. These materials can thus provide camouflage countermeasures, in threat situations, against IR cameras operating in the 3 to 12 μm regions. These cameras are not night-vision devices, which operate in the near-IR (0.9 to 1.5 μm) region and are in reality image-intensifiers which need some, minimal light to operate (they do not work on, e.g., moonless nights). Such adaptive, IR camouflage can give tremendous advantage in night operations. Performance can be judged by several parameters, e.g. %-Reflectance (%R) contrast in the IR, apparent temperature variation and emittance (integrated emissivity). 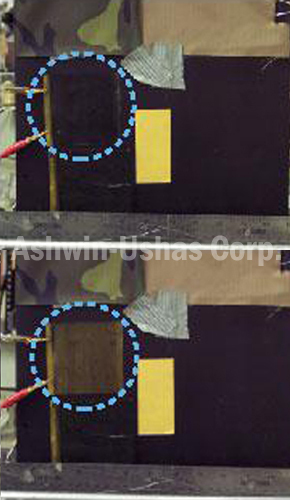 Ashwin’s patented dynamic (switchable) IR-electrochromics technology is based on Conducting Polymer (CP) IR-electrochromics, a unique skin design, and a “smart” Controller for efficient, adaptive camouflage. They have low power (+/- 3 VDC, < 50 μW/cm²), extremely low cost. The electrochromic skins are thin (< 0.5 mm), flexible, very lightweight (0.12 g/cm² or 1.2 kg/m²), extremely durable, cuttable with scissors to any shape/size/area, affixable to any surface. 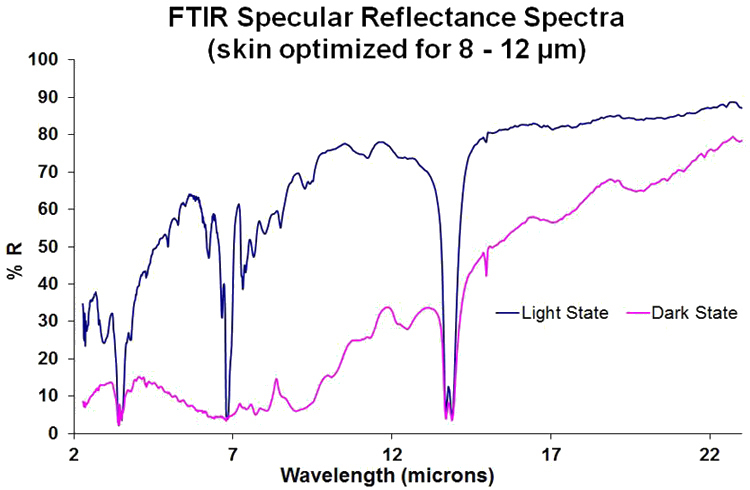 76% (extreme light, low-emissivity state) to 4% (extreme dark, high-emissivity state) at 10 μm (LWIR), as measured by FTIR Specular Reflectance. 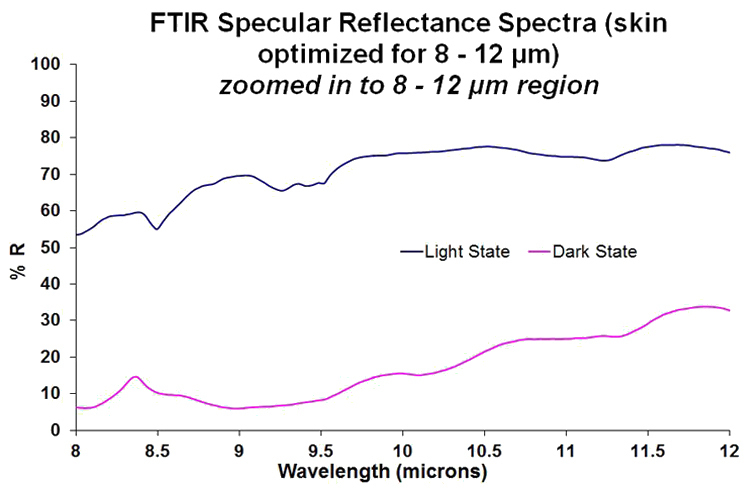 55% (extreme light state) to 13% (extreme dark state) at 5.5 μm (MWIR), as measured by FTIR Specular Reflectance. Values “dialable” to any intermediate values between above light/dark extremes. Skins can be optimized for the MWIR, LWIR or both. Switching Time, for full switching between extreme light and extreme dark states is < 2 s.
Matching to all kinds of backgrounds, from cold sky, water and foliage to soil, desert sand and man-made structures like buildings, vehicles and soldier uniforms. Demonstrated to have excellent durability against expected environmental conditions, including sand blasts, wind, heavy rain and extreme temperatures (-40 to +80°C). Superior in performance as well as cost to competing technologies such as Peltier plates, other electrochromic systems, thermochromic systems. IR-electrochromic materials change “color” in the IR. This “color” is variable and can be adaptive, i.e. matching the background, much like a chameleon, except in the IR. These materials can thus provide camouflage countermeasures, in threat situations, against IR cameras operating in the 3 to 5 μm (mid-wave IR, MWIR) and 8 to 12 μm (long-wave, LWIR) regions. These cameras are not night-vision devices, which operate in the near-IR (0.9 to 1.5 μm) region and are in reality image-intensifiers which need some, minimal light to operate (they do not work on, e.g., moonless nights). Such adaptive, IR camouflage can give tremendous advantage in night operations. 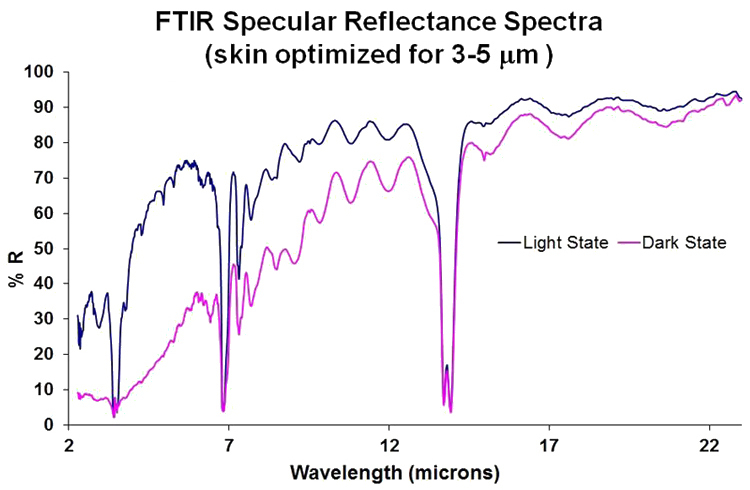 IR Reflectance spectra in the two spectral regions of interest (3 to 5 μm (mid-wave IR, MWIR) and 8 to 12 μm (long-wave, LWIR)). 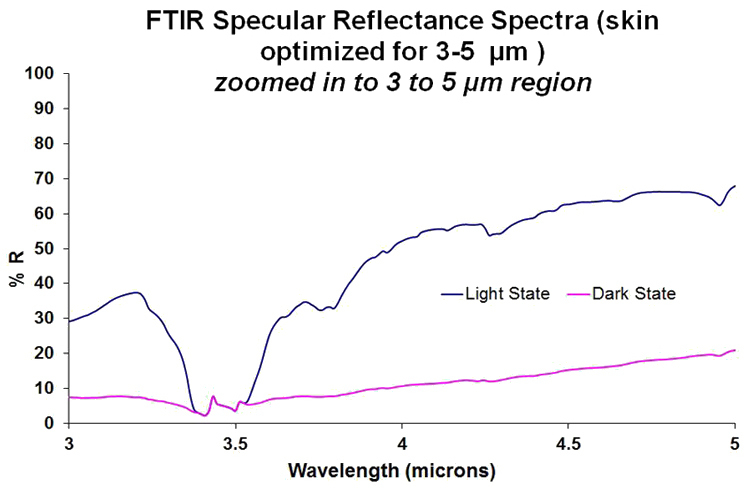 Typically, Specular (rather than Diffuse) spectra give the most information. The larger the contrast between light and dark states, the better the performance. 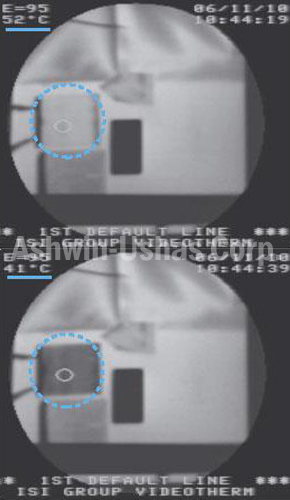 Apparent temperature, as measured by an IR camera. For best camouflage, the temperature of the IR-electrochromic skin should be as close as possible to that of the background that one is trying to match. Emittance (integrated emissivity). 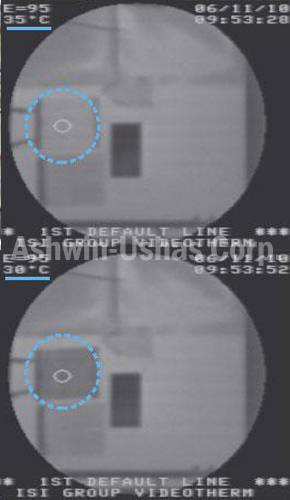 See description of Ashwin-Ushas Variable Emittance Skins. Conducting Polymer (CP) as the active IR-electrochromic, yielding the variable IR signature. Unique design, allowing direct exposure of active IR-electrochromic to external environment and single-microporous-membrane construction. Thin (< 0.5 mm), flexible, very lightweight (0.12 g/cm² or 1.2 kg/m²), extremely durable skins, cut with scissors to suit any shape/size and area. Operate with small, applied DC voltage (less than +/- 3 VDC). “Smart” Controller for efficient, adaptive camouflage. Corresponding emittance variations are ca. 0.15 to 0.80. Skins can be optimized for LWIR, MWIR, or both. Quasi-independent control of IR and Visible signatures. Cyclability: Tested to 10,000 light/dark cycles without significant degradation. Arrays of Peltier plates which are actively, rapidly heated/cooled. These are primarily for countermeasures against night-vision, i.e. near-IR, have very high power requirements and, of course, do not work in the MWIR or LWIR. They are also very expensive and bulky. Other electrochromic systems, e.g. those based on poly (2,7 carbazole) derivatives. These have extremely poor IR performance, no match for our systems. Thermochromic systems, e.g. those based on, and choleric liquid crystals, or active heating of a metallized plastic surface. These again have extremely poor IR performance, no match for our systems. Other variable emittance technologies developed for use in space are not suitable for adaptive, terrestrial IR-camouflage. (See description under Ashwin-Ushas Variable Emittance Skins). 1⁄5 to 1⁄10 the cost of other technologies described above (which in any case do not work well in the MWIR and LWIR). Side view (IR, 8-12 mm) of person with device affixed to arm/shoulder. IR picture taken with VideoTherm 300. Left: Light (non-emissive) state of skin, showing matching to person’s clothing and complete camouflage of heated area. Right: Dark (emissive) state of skin, showing area heated. The tailorable variation of the apparent temperature (i.e. IR signature), as shown, allows matching with different backgrounds. Visible photo of the skin, highlighted in blue circle. 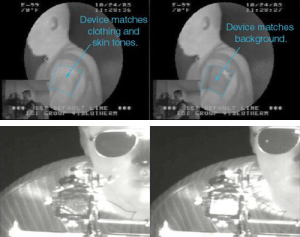 Various electrochromic states of skin, with apparent temperatures (as measured by IR camera, at elliptic spot inside blue circle) shown. Bottom row: Left and Right, respectively, light (non-emissive) and dark (emissive) state of skin. Top row: Same, Visible-region photo.